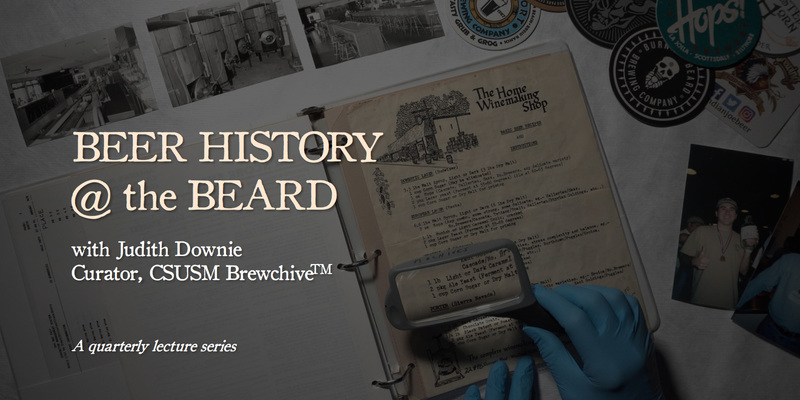 Grab a pint, pull up a barstool, and join us for Beer History @ the Beard! We’ve joined forces with Judith Downie of the CSUSM Brewchive™ to bring you this fun, informative—and dare we say educational—lecture series on the history and significance of craft beer in San Diego. The series will focus on a different subject each quarter, with 100% of donations going to fund further research at the Brewchive. California State University San Marcos is the 20th campus in the CSU system and has launched the EngiBeering™ program to explore the science, engineering and art behind brewing craft beer. The Brewchive is an archive of the development and community of craft beer in San Diego. Judith Downie is the Curator for the CSUSM Brewchive. Through gathering documents, oral histories, and more, her research focuses on the women in San Diego, with a specific emphasis on the industry’s ‘Third Wave’ (starting with the 1980s through today), whose contributions to the success of the local brewing industry have been overlooked. In addition to her work with CSUSM, Judith has authored a number of articles on San Diego beer and early women in San Diego brewing.